One of my best gardening tips is that many trees, shrubs and perennial plants can be grown in pots. This is a trick I learned as a novice gardener from the great doyenne of gardening, Martha Stewart herself. I love this technique since, come spring, the patio planters do not need to be replanted. They burst into bloom along with the rest of the garden. They overwinter in their pots, right on the terrace, if in a weather resistant pot or in the shed, if the pot is not. 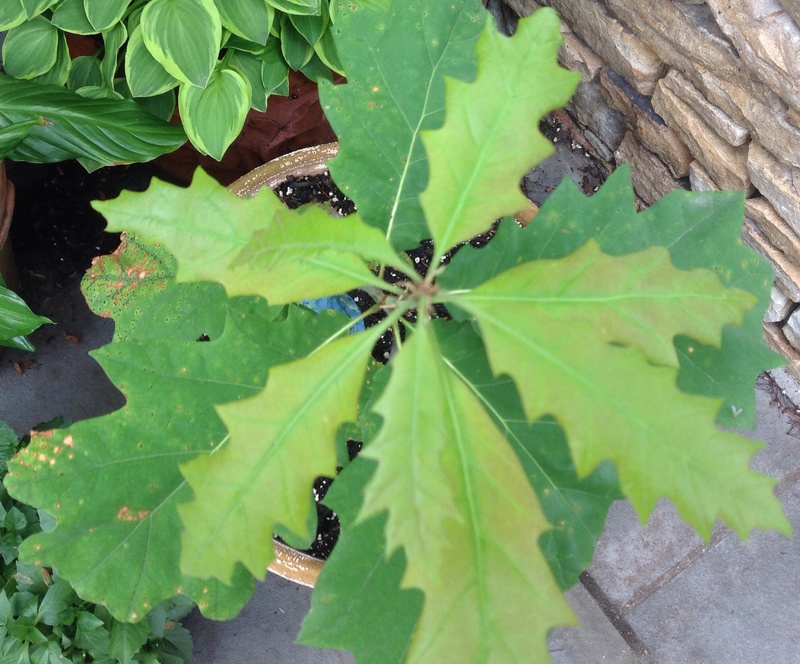 One of my most successful specimens grown in a pot is a red cut-leaf maple sapling I found self-seeding in my garden. I put it in a styrofoam planter that could withstand harsh Pennsylvania winters without risk of cracking. To my great joy, the sapling returned the next year and has continued to thrive. Frustrated with the weeding of the soil around the sapling, I decided to transplant some small leaf hosta plants and underplant the tree. After a couple of years, the hosta has multiplied and now completely fills the base of the tree. No more weeding needed! The gorgeous chartreuse color complements the red of the maple. In about 5 years of growing I have yet to transplant the maple to a bigger pot and don’t fertilize it other than spread tea leaves and coffee grounds on the soil to enrich it. I top off the soil levels when needed. I grow hydrangea in pots as well and they do extremely well in this environment. One of the added bonus to growing shrubs and trees in pots is that they can be moved around as desired. 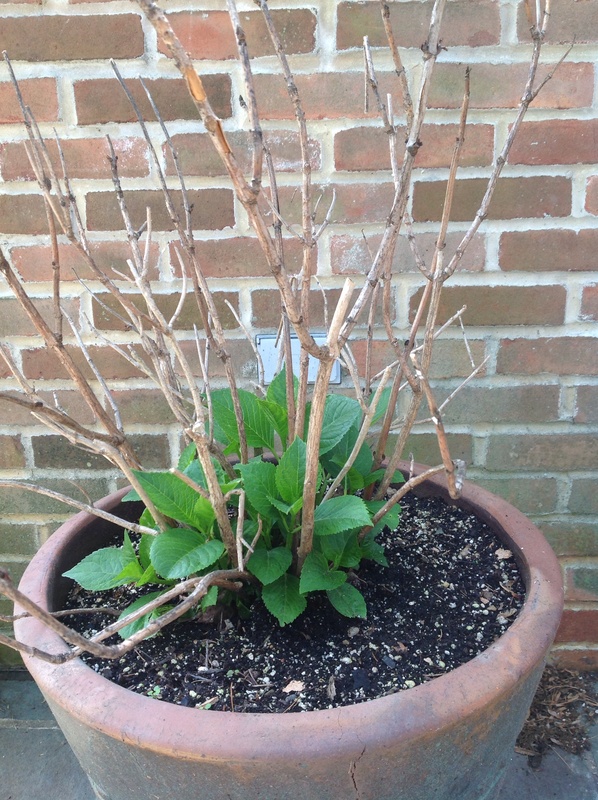 This was a particularly difficult winter for all hydrangeas in my gardening zone and those in pots fared no worse than those in the ground. 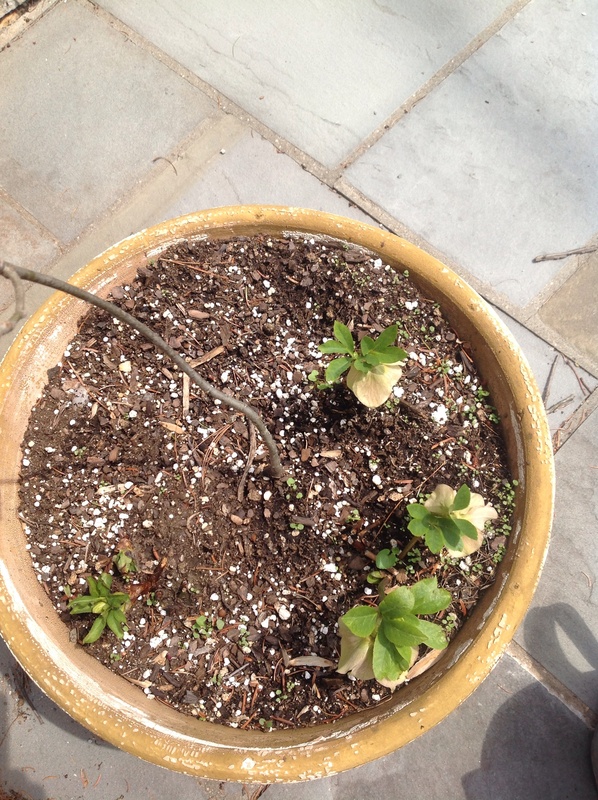 A new addition to my trees-in-pots last year was a white oak sapling given to me on Earth Day, which I underplanted with hellebores. The underplanted hellebores are just starting to grow. In a few more years, they will fill the base of the white pine. In a large half whiskey barrel planter I grow a columnar boxwood which provides year round greenery. 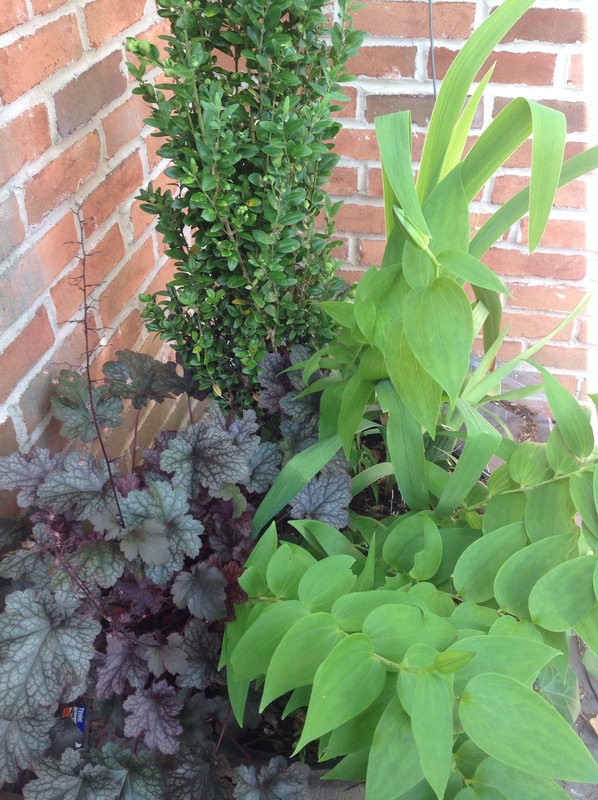 In the same planter I grow Heuchera, English ivy, blackberry lilies, and spectacular stargazer oriental lilies , all of which return year after year with no effort on my part. I add pansies in the spring and some coleus in summer to supplement the perennial blooms. This planter evens has crocus and daffodil bulbs tucked in it for spring flowers. This perennial planter is designed along the planter principals of providing “thrill-fill-spill” content. When planning your garden pots, think beyond annuals. Trees, shrubs and perennials are worth experimenting with and will reward you with years of maintenance-free, beautiful plantings. Transplant to larger pots, as needed. Happy gardening! 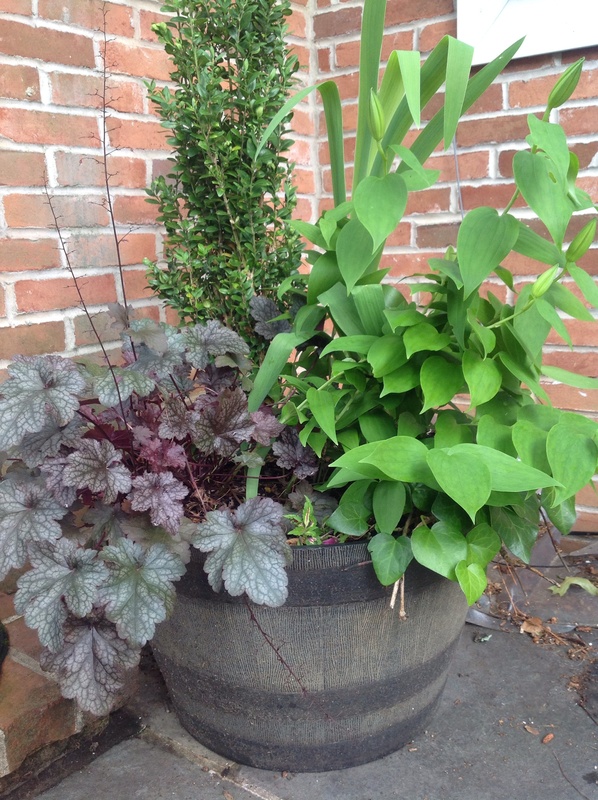 This entry was posted in Gardening and tagged growing cut leaf maples in pots, growing hydrangeas in pots, growing oaks in pots, growing tress in a planter, Perrenial gardening in planters, underplanting trees in pots with hostas and hellebores by Johanne Lamarche. Bookmark the permalink. I had NO idea trees could be planted in pots!! I am going to try this!!! Seriously! I would love to have a little maple tree on our back deck, and this would be the way to get that! I’m also very, very interested in the way you put the hosta in there. I would think there would be no room for it to grow with all the roots of the tree. I’ll have to study that a little closer. It’s a terrific idea, it looks fabulous, and I’m all for not having to weed something!!! If the potted trees can survive a PA winter, they can certainly survive a MO one!!! Thanks for the tips, Johanne. I’m going to talk to the guy at the nursery about a sapling that won’t grow very big and get to planting! Oh…you didn’t mention WHEN you planted it in the pot. Is it best to do it in the fall like trees in the ground? And the coffee ground thing…I take ours out every morning and dump them right into whatever pot I think needs it. My sister does crushed up eggshells, too, but I’ve never tried that. 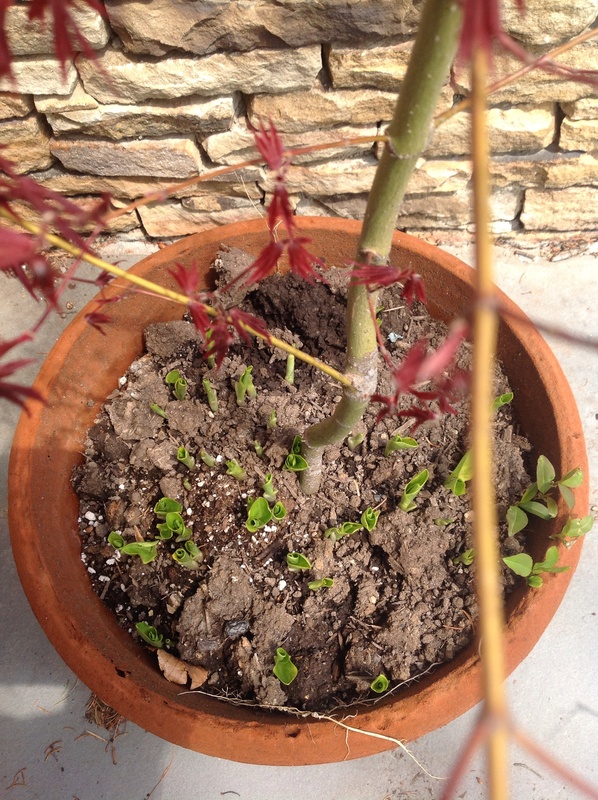 I found a small sapling in my yard in the summer and planted it in a pot. A neighbor did the same and had success as well. But you are right Alycia that it is less stressful for any plants to be planted in the fall, or early spring. You would just need to water in the summer. Which brings me back to the no maintenance thing: I only water the potted trees whenever I water anything else in pots, about 2X/ week in the heat of the summer. Hardly ever in the spring or fall, once they are established. I think the principle works because the tree is restricted by the size of the pot from growing. The red maple, hydrangea and white pine are not dwarf specimens. With the hosta underplanting, I planted just a few transplants from my garden and they filled in after a season or two. Glad I am inspiring you too, Alycia! I always love reading your thoughtful comments. Enjoy the weekend! We have glorious weather in Philly!!! I’ve had success with potted trees and perennials too. 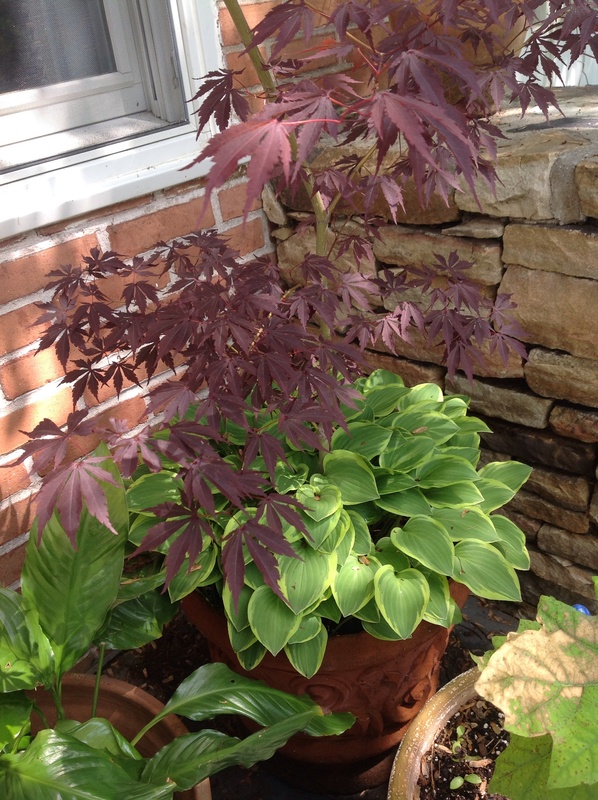 My Japanese maple is my favorite success – it was a sapling that had accidentally gotten trampled. I potted it and brought it with me when I moved. It grew to a full-fledged tree and 10 years later, I gave it to a friend to continue loving it when I moved to NYC last year. Now that I don’t have outdoor space, I’m considering growing one indoor. What do you think? I do miss my Japanese maple tree. Asian style really speaks to me. I’d love to see you if the opportunity presents itself. I do live in Brooklyn, but I work in Manhattan so that might be easier for you. A sapling from your yard would be wonderful! Hope you enjoy your trip to Timmins! Glad you like it Charlotte! Thanks for reading my blog also!!! Hope you are enjoying your summer. The squirrels went after my Japanese maple this year. Please tell me what underplanting is. Also how large of a container would I use for a tree – sapling? Thanks! Underplantings are plants that can coexist with the main plant and complement it in color, size and light needs. 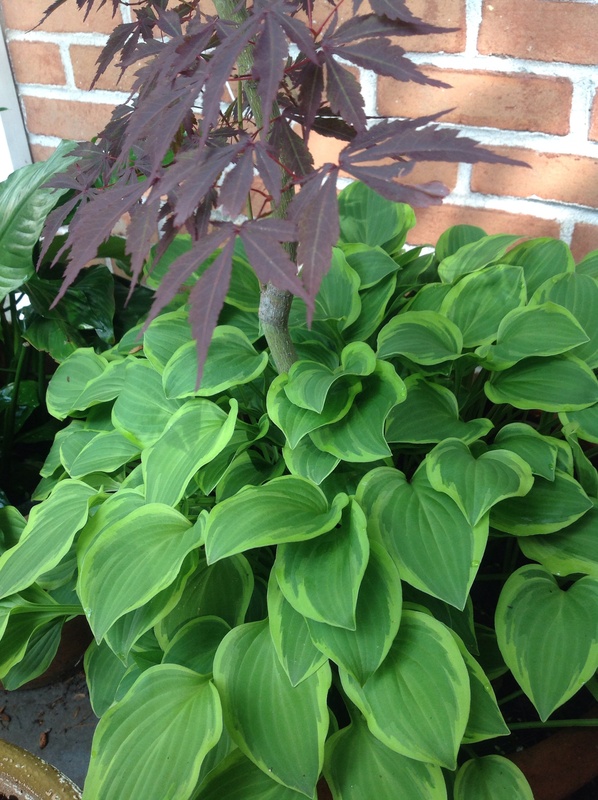 I underplant my Japanese maple with small lime green hostas. They fill in the soil and prevent weeds from growing. The chartreuse looks great with the burgundy of the tree and the hostas like the shade of the tree above and don’t grow very tall. I would say choose a pot that is about 3 times the size of your sapling. As it grows, transplant it to a larger pot. Mine has been in the same pot now for 5 years. I enrich the soil with compost when the levels go down. I would say my tree has stayed the same size for the past 5 years and has likely adapted to its pot. To deter squirrels from your sapling, incorporate some hot pepper flakes on top of the soil and spray the sapling with a natural capsaican/wax/rotten egg mixture such as Deer Off. It won’t hurt the tree and should deter squirrels. Mine has never been disturbed and we have tons of squirrels. The underplantings will decrease the temptation for the squirrels to come and bury their acorns in the soil of the sapling. Good luck! Thank you very much for this good instruction. I don’t know that I can save the tree. Maybe if the roots are still alive? I have to take it in in winter since the temp goes down to -20 to -40 degrees sometimes. I leave mine outside in its pot year round. It gets quite cold and snowy here as well. We are in zone 6. 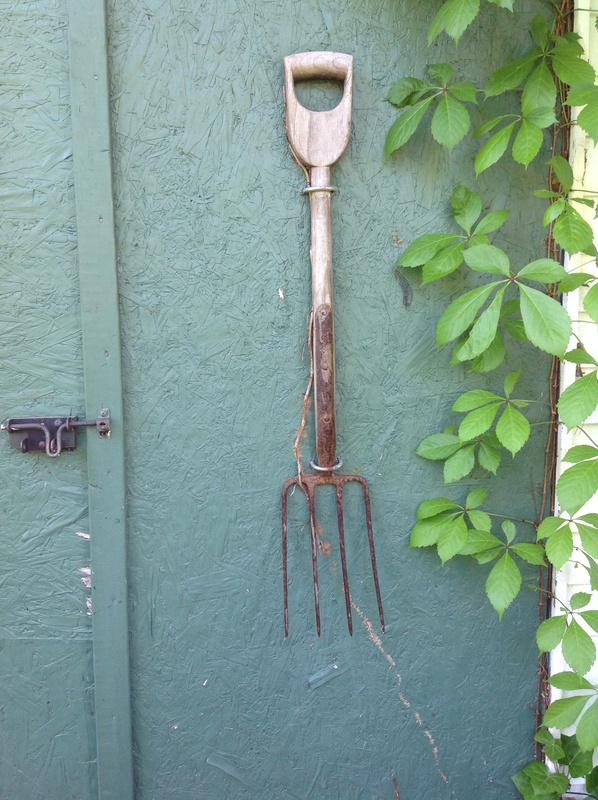 You might want to plant a new one and leave the struggling one outside and see how it does. The idea is that the potted tree is exposed to the elements just like its mates in the ground. I think it gives them endurance. They experts say it’s 4b zone here. I’d hesitate to do that a friend had one outside and it didn’t make it. Really it’s so cold here that a person’s nose hairs freeze. HAHAHA! Wow! Do you guys build snow forts to live in? Eh? We did build snow forts but just to play in, eh! hahaha…that’s the most fun with snow, right? When there is snow for 6 months you have to embrace it! How well I know that!